Craig Seidel (also the plantiff in the Rivsu case) is picking up his Show or Display Nissan Skyline R34 on September 10th, 2018. His R34 GTR has been modified by JK Technologies to meet EPA requirements, making it the first truly federally legal R34 Skyline in the USA since Motorex shut down. And technically, any other federally legal R34s were grandfathered into legal status after the Motorex fiasco, while almost certainly not being truly federally compliant (more on that later). He'll be picking up the car in Baltimore, and driving it 1400 miles (over 50% of his 2500 yearly allotted Show or Display miles) to South Dakota. the cost was, in Craig's words, "way too much". As shown in the screenshot above, the car has been at JK Tech for 3 years while they were working on making it compliant for US law. The car was imported under the Show or Display rule, which allows a handful of cars - under strict requirements - to enter the USA without complying with NHTSA rules. They still must comply with EPA requirements - the piece of the puzzle that JK Tech has been working on. While the specifics of that program are kept secret, one of the big hurdles of federally legalizing the car was OBDII compliance. 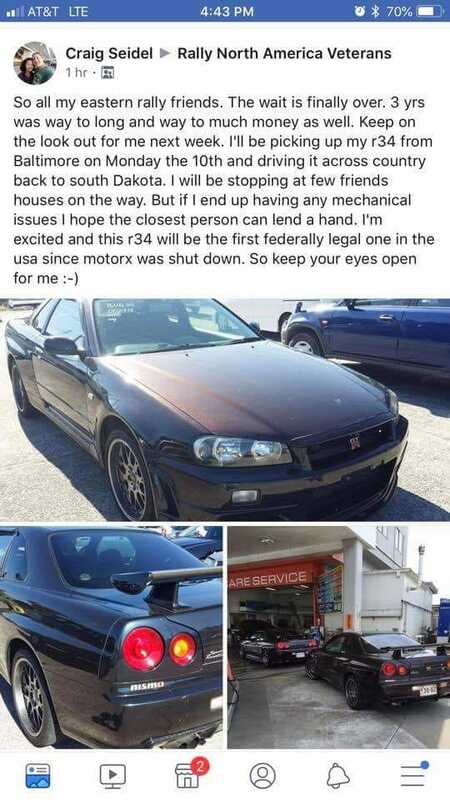 Any other "federally legal" R34s in the USA - 12 by current count - were grandfathered into federal legality by the government when Motorex closed. In 2005, the federal government clamped down on Motorex's scheme, and rescinded the disputed crash test ratings for the R32 and R34 in 2006. This means - by technicality - Craig's R34 is the first truly federally legal R34, since a rescinding of the crash test ratings of the R34, and Motorex already being known for shady dealings, almost certainly means the R34 was never actually crash tested or modified to be DOT compliant. To read more about the Motorex fiasco, read this great article from 0-60 magazine written by Richard S. Chang. Craig posted a few photos of his R34, a picture of the bond release, and a video of a data scanner plugged into the OBD2 port reading live data. “I’ll just wait until the hype dies down and buy a nice GTR for $15k” – Says increasingly nervous man for the hundreth time since 2014.